Road biking on the summit is spectacular and can be as challenging as you wish to make it. It is, however, limited to the single paved road that runs through the summit, Donner Pass Rd which is Old Highway 40. The entire route is shown in the map below with the elevation profiles. It can be done in its entirety from either direction or it can be done in parts starting anywhere on the route. 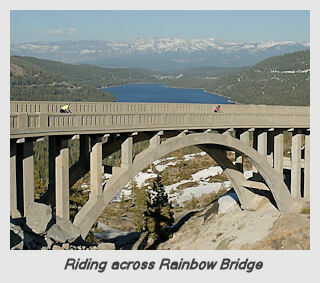 The most challenging, and spectacular, section of the ride is the Donner pass ascent. The ascent is 3.1 miles with an average slope of 7% and maximum slope of 16%. The climb is open all the way with great views of Donner Lake and Pass to distract you from the burning in your legs. The ride across the historic Rainbow Bridge is a unique riding experience. Just make sure your brake pads are in good condition if you are riding back down the pass. As a comment on the quality of the ride through the Donner Summit area, the Amgen Tour of California is including it in their 2011 ride. When I was in my twenties I used to live in a cabin on Donner Lake, I worked at the North Star Ski resort for a time and at O B’s Board in the town of Truckee. I bought a bike at a shop in west gate and used it as a primary form of transportation back and fourth between Squaw Valley, the Truckee Airport and where I lived at Donner Lake. I rode up the summit a couple of times just for something to do and remember how difficult it was by the fact that I remember hitting first gear for a while on a ten speed bike. I am fifty two now and will try it again some day soon, hope to see you there, it is a must have for your to do list. Can’t beat the view on the way down, don’t expect to ride wide open going down, check your speed with your brakes often. You will have a feeling of zero accomplishment if you have some one drop you off at the top and coast down, so don’t puss out. I also recomend the Pacific Crest Trail between Donner Summit and Squaw Valley, you can make it one day if you start early bikes were not allowed when I hiked it. I can’t help commenting on this great post. Thanks for the insider explanation of what to expect on my road bike and the maps give such a perfect visual. Well written! Much appreciated! Great post about a great location. The ride eastbound from Cisco Grove to the summit is a great 26-mile RT training ride. The road is usually open, but avoid the weekend crowds during ski season. Visited from the UK a couple of weeks ago and rode from Tahoe City to the Donner Pass summit and back. I have to say that the ascent of the Donner Pass is one of the best and most enjoyable cycling climbs I have ever ridden! I only wish I could ride it again. Great article. ridewithgps just mapped a route down from the summit that includes a bike path that goes through something called China Wall. It comes out onto South Shore Drive (of Donner Lake). There is no name on this path. Do you know anything about it? Is it suitable for a road bike? Thank you! Unfortunately, GPS and maps get things wrong up here quite often. There is only one way down from the summit on a road bike and that is the Old 40 Highway. There are remnants of the Old Lincoln Highway that can be hiked of mountain biked (not a great ride, lots of carrying your bike). The ride down or up Old 40 is a great ride as long as you do it when it is cool. Getting an early start in summer or riding when it’s cooler in the sping or fall is recommended. There is no shade so on a hot day you fry. Hope this helps. The climb from the lake side is only 3ish miles but it is still worth getting the gearing correct. I went up with a standard chainset with 25 on the back thinking it’s only short but after 2 miles started to dream of compact chainsets. Also as others have said do it out of the strong sun we went up at 1-30pm thus I speak from experience. Of course the main message here is don’t let a tourist from the UK plan your northern California ride. My one recomendation is to take the quieter anticloakwise route round the lake, in the trees on the lake side with nice views and fewer cars. My dad had a house on Old Hwy 40 about midway between the State Park and the West End (there was a natural boat ramp/swimming access just across the street). I would go visit in the summertime (and a couple of winters) and spent 18 months there after graduation from high school. Worked at Boreal Ridge on the Alpine Slide and then flipped burgers at Gold Coast at Squaw Valley for one season in 1980-81. My dad owned and operated O’B’s Board in Truckee. I remember trying to get ski-fit by pedaling around Donner Lake 13.2 mi. and pedaling into Truckee to swing by E. B. White’s (run by my step-mother), or O’B’s. I also remember participating in the craziness of skateboarding down Old Hwy 40 from Donner Summit on full-moon nights. Yes, this was before I had any self-preservation brains!! This is absolutely one of my favorite rides. I usually go to Reno/Truckee a couple of times a year to play golf with friends and always take a few extra days to ride bike. I love the loop in the desert from Reno over the Geiger Summit to Virginia City, Carson City and back on old 395 to Reno. Then on the last day I stay at the Truckee Hotel or the River Ranch by Tahoe City and ride up Donner Pass to Soda Springs and back. I am 71 years old and I intend to do it for as long as I can. I maintain a blog of my bike adventures with great photos at http://www.thecyclingtuscan.com . Cheer to all.